A common problem for residents with incontinence is skin fragility and damage which requires extra time and care when being washed or showered. Where physical and or cognitive impairment are evident, personal hygeine care can become uncomfortable and distressing. Q: What are the benefits of Peri-Foam? A: The combination of essential oils and emollients produce a skin management product to clean, soothe and protect with the added benefit of an odour neutraliser. Q: Can Peri-Foam be used for urinary and faecal incontinence? A: Yes, the added benefit is the odour neutraliser. Q: How often should I use Peri-Foam? A: As often as required, Peri-Foam is water based and will not cause any build up of product on the skin. Q: Is Peri-Foam only used in Aged Care? A: No. Peri-Foam is now being used in Palliative Care as a full body wash, Home Nursing, Community Nursing. Q: Why use Peri-Foam in place of soap and water? Q: Is Peri-Foam only useful for incontinence? A: No. 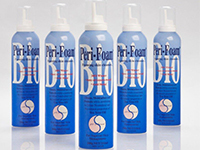 Although originally developed as a skin management product for incontinence, Peri-Foam is now being used as a full body wash for patients with limited mobility and wound cleansing. 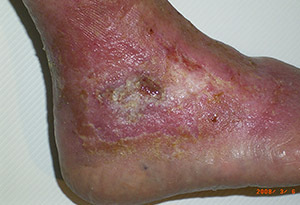 Chronic wounds are often rendered recalcitrant through prolonged inflammation and biofilm deposition. Malignant, non-healing wounds are emotionally, socially and physically taxing. The lesions are readily prone to bleeding, copious exudate, pain and malodour. Bacterial and fungal infection are often opportunistic in these wounds and yet their pungent smells and skin excoriation provide discomfort and social isolation. At the Sydney Adventist Hospital (SAH) we commended the use of Peri-Foam on a number of individuals experiencing cervical and vulval cancer – often involving metastatic spread. These ladies found regular washing most painful or even impossible to attend. However, the majority of patients who were willing to use Peri-Foam found its application easy and gentle.